If you’re looking for the rustic charm of a log cabin without the hassle of dealing with real wood, a seamless steel log siding is probably your best option. There is nothing more charming than the look of a traditional cabin-style home but when you’re dealing with mold, mildew, and pest infestations on a regular basis it’s just not worth it. However, with seamless steel siding that is designed to match the look of log siding you will be to have a home that is the envy of the neighborhood with no maintenance requirements. Thankfully, ABC Seamless of Albuquerque is available to homeowners in Rio Rancho, NM, and provides this high-quality style of log siding. 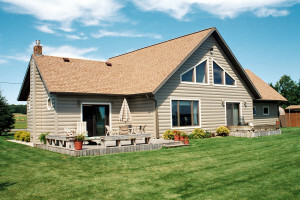 We custom fabricate our siding with foam-backed insulation that will be packed into each individual log contour. Once installed, this will reduce the amount of heat transfer into and out of your home. This will even place less strain on your HVAC system and could reduce your monthly energy bills. To learn more about the log siding options available to homeowners in Rio Rancho, NM, and the surrounding areas, contact ABC Seamless of Albuquerque today.